Preferred option for 9002 Greenwood Ave N.
Seattle’s Design Review Program has a lot of upcoming meetings for new projects in the New Year, but one in particular has caught our attention. Meet 9002 Greenwood Ave N, a brand new four-story, 48-unit microhousing development in Greenwood. As far as we know, this is the first microhousing project to proceed through design review under the new microhousing rules. But before we get to the details of this project, we want to bring you up to speed on the new microhousing code. Way back in October, the City Council adopted an ordinance to specifically regulate microhousing developments in the city. The adoption of new rules was in response to significant, longstanding concern amongst community groups, activists, and residents about microhousing and congregate housing projects. Previously, these developments were subject to the same rules that applied to all congregate housing developments like dormitories and senior housing. Projects would often proceed as townhouses by proposing maximum ratios of bedrooms to shared kitchen and bathroom facilities. The City responded with a new set of rules to treat micorhousing and congregate housing differently in three key ways: separate definitions and intent, zoning district-specific rules, and the rigor of review by project scale. Separate definition and intent. Microhousing and congregate housing are now clarified in the code as separate uses. In essence, microhousing are differentiated by the character of the living arrangement. Microhousing is geared toward independent living of residents in “small efficiency dwelling units”. Units required to be a minimum size of 220 square feet and contain a full kitchen. Previously, groups of eight sleeping rooms with a shared kitchen were permissible. Meanwhile, congregate housing is now geared more toward the elderly, infirmed, disabled, and students. Unlike small efficiency dwelling units, the Land Use Code explicitly discourages private kitchens and places no minimum size on units in congregate housing living arrangements. Zone district-specific rules. Microhousing is effectively restricted to zones that permit multifamily dwelling uses like mixed use zones, commercial zones, and lowrise and midrise residential zones. Private congregate housing developments, however, are further restricted to only Urban Villages and Urban Centers with high density zoning types like Neighborhood Commercial 3, Midrise Multifamily, and Downtown zones. Although, exceptions are granted when congregate housing developments are owned by or affiliated with colleges, social welfare providers, and licensed support services. Project review by scale. Most new microhousing and congregate housing projects are subject to some form of design review. As you can see in the table below, the entry threshold for design review begins at 5,000 square feet of gross floor area. This is basically the total square footage of a building. In the instance of the Greenwood project, the gross floor area is anticipated to be between 17,415 square feet and 18,694 square feet. Therefore, the project is subject Administrative Design Review, a type of design review that is geared toward a shorter process of public and neighborhood feedback on priority design issues. The Land Use Code defines microhousing as “small efficiency dwelling units”. The Greenwood microhousing will be located at the corner of Greenwood Ave N and N 90th St. The area is currently zoned as C1-40, a commecial/mixed use zone with a maximum height of 40 feet. The applicant is proposing a four-story apartment building, which meets the 40-foot maximum for the zone. At least 48 units will be provided, but the applicant is exploring an option to maximize the site with 50 units. Project amenities include a rooftop deck with green space, some private patios, and bike storage on the ground floor. The site does present some challenges given that the eastern portion is steeply sloped. To address this, the applicant plans to retain the building into the sloped hillside. As you can see in the massing comparisons below, two structures are immediately adjacent to the site. On the north, there is a four-story apartment building while on the east there is a single-story single-family residence (which is also zoned C1-40). Despite how close the single-family residence may appear to the proposed structure, the applicant plans to maintain at least a 7-foot setback from the east property line. Options A and B would have 48 units while Option C (the applicant’s preferred option) would have 50 units. Options A and C would have the most continuous frontage on Greenwood Ave N.
Options A and B would accentuate the corner by projecting it toward the street. Option C would modulate the primary facade, but would leave overhanging facades on the north and south sides. Options A and B would have corner entries while Option B would have an entry toward the center on Greenwood Ave N.
Option B would stepback the fourth floor from the south side. Options A and C would have the most opportunity for landscaping along Greenwood Ave N frontage. These are just a few of the comparisons that can be made between the options. But the issues of the project proposal could of course expand far beyond the scope of just these details. I do want to bring up one issue worth mentioning: frontage setbacks. Urbanists are often concerned with how much a building is setback, and in this instance the streets and sidewalk present an odd circumstance. This project proposal consists of deep setbacks along both street frontages. Neither of these are exactly by the applicant’s choosing. The frontage of Greenwood Ave N has a very wide public right-of-way (90 feet to be exact). The applicant’s proposed layout would in effect have the apartment built right up to edge of the Greenwood right-of-way–even though the sidewalk does not begin for another 15 feet from that point. If you’re interested in attending the community design review meeting, you can do so next week. 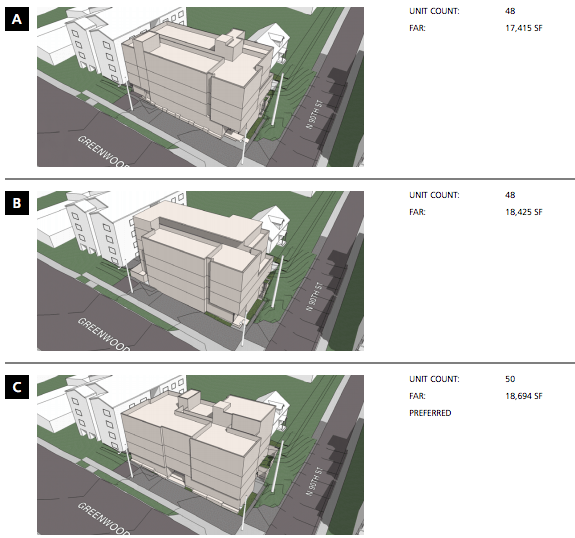 The Northeast Design Review Board will convene its meeting at the Ballard Community Center located at 6020 28th Ave NW. The meeting starts promptly at 6.30pm and begins with a presentation by the applicant, followed by Q&A from Board, and ultimately an opportunity for public comment. Alternatively, you can submit comments on the project to the project planner, Lindsay King. Should you choose to comment via e-mail, please ensure that you do so before Monday if you would like Lindsay to incorporate your comments into the Design Review Board packets. It is helpful to quote the project number (3018316 in this case), and comments should be carbon copied to PRC@seattle.gov. In order to be most effective, comment on issues that fall under the citywide and Greenwood/Phinney design review guidelines. *It should be noted that these are the preliminary massings of the proposed structure. Further refinement of materials, architectural features, and layout modifications will be made in response to comments and feedback at a later stage. The second thought I had was about the wide right of way for Greenwood. I wonder what that is about? Maybe they had plans at some point to add even more lanes. I can’t imagine them doing that now, so it seems a shame to force developers to build with big setbacks when the city probably will never use the land. Unless of course, they want to make really wide sidewalks through there (which seems unlikely). I suppose that someday they could build light rail through there, so there is that. But that brings up some questions: How far does that really wide area extend? Would light rail (or a streetcar) even make sense along there? My guess is that the answer is that we would never put light rail on the surface through there (underground or elevated maybe, but not on the surface) which means that the city is restricting development for no reason. If the city allowed development closer to the street, could it charge for that? In other words, could the city basically say to this developer (or any developer) that they can develop closer, but for a fee? If so, that seems like a pretty good deal (for everyone involved). The city gets a bit more money and the developer can build on a little bit more land. A couple thoughts about this design review. First, I wish there was a simple two step process. The first would be to ask if anyone wants a design review for the lot in question. This would take a minimal amount of time, and thus be very cheap. In this case, I think the answer would be “no” (people don’t care). It should be obvious why they don’t care when you look at the property and the properties nearby. This isn’t Capitol Hill. There aren’t any really nice houses or apartment buildings next to this, or nearby, so “ruining the neighborhood with an ugly apodment” just won’t happen. If anything, I think the neighbors will be thrilled that something — anything — is going up here. Also, this isn’t going to take up the entire block, so pedestrian access is not an issue. This is a relatively small building going in next to lots of other small (and I would say not very attractive) buildings. No big deal, and I think the neighbors feel that way. It is shame to spend a bunch of money on plans that few (except the wonky folks on this blog and others) care about. Let’s face it, if this wasn’t interesting from a land use standpoint (the first micro-housing project under review — how exciting) no one would care. Also, from my understanding of regulatory processes, doesn’t the cost go up (way up) if people comment? In other words, if no one says anything, or if everyone says “looks good to me”, then it reduces the paperwork cost dramatically. But if people say “Option B looks much better, because blah, blah, blah” or “You should really do it differently, and slope the wall the other way, otherwise it causes too much shadowing, etc.” then folks spend a lot of time dealing with the comments. Since this is the first case of its type, I think that would be really bad for those that want affordable housing. It probably wouldn’t kill this project, but it might make others reconsider theirs. It seems to me that based on this project, the best response is no response, or maybe just an email saying “any of those options look good to me — just build it” would be fine. I’ve thought that it was alarmist to suggest the new requirements would altogether kill micro-housing but I think there is a much more legitimate concern; that the additional cost will make other types of development more profitable, possibly shifting development dollars that might’ve been used for micro-housing to other developments (luxury apartments). I’m skeptical this will happen and I’m not sure how to measure this but it’s encouraging that there are still micro-housing developments in the pipeline. It’s certainly a fair question to pose. We won’t immediately know, but there are some metrics that we likely could compare. I’m curious to see how some of these projects progress and compare in design to the ones that didn’t go through this process. Of course, this is much more than just design review. The minimum square footage requirements and full kitchens are likely big game changers. If nothing else, it will substantially increase the cost, which will decrease the number of projects that make financial sense, which will, in turn, push up the cost of rent. Design review will kill all microhousing. Roger Valdez said so. Only one way to find out I guess! We’ll keep an eye on this project and see what happens. I think it is impossible to tell by just looking at what they charge. Developers misread the market all the time. Maybe they thought they could charge 1,000 bucks a month, but now they charge 700. In other words, maybe, after it is all rented out, someone says “oops, that wasn’t worth it, we should have built something else (or not bought the property in the first place)”. The best way to determine the effect is to figure out how much this costs (the developer) and then figure out how much that costs per unit. This is only a case study, of course (other reviews might be more or less expensive per unit). As a case study, it is interesting to point out that from what I can tell, this land is essentially useless unless it is developed. This is different from, say, a small house on a huge lot, or a parking lot (which at least gathers a few bucks every month). This makes it prime for some sort of development. In other words, no can say “building anything is too expensive here, because of the cumbersome process, we are better off just making money off it as is”. So it was likely that someone would build something and is not indicative of land that is underutilized (like a parking lot). The fact that they are building the smallest apartments available shows that we are still in a big rental crisis caused by too much demand at the low (affordable) end. Otherwise, they would built luxury apartments, or houses (neither of which have the expensive review process). This is obvious to some, but not to others. Despite the fact that the city regulators seem to be doing all they can to discourage affordable housing, the market still wants it (and wants it badly). Rental prices are not going up because rich renters are pushing up the price; it is going up because of increased demand at all levels. This project would seem to suggest that Roger was right. Under the previous code, this project likely would have been designed as a 6-unit project, with each unit featuring 8 bedrooms and sharing a single kitchen. Because it would have avoided a bulk of the administrative and delay costs, these rooms would have likely been rented for something in the neighborhood of $650/mo (with utilities included in the rent). Instead, what Caron has designed is a straight-over-tackle apartment project. 48 units, 48 kitchens and all the added process. You might like to call this “microhousing” because the units are smaller than average, but in reality this is no different than the thousands of apartment buildings built in Seattle over the past hundred years. With the added costs, the developers will likely charge something closer to $1,000/mo for these studios (with separately metered and charged utilities). Same financial result for the developer, but $400/mo more expensive for the average renter. So yes, Roger was right. It seems that the days of being able to find a $650/mo place to live, close-in and in new construction was killed by the legislation. Have you confirmed that the price will be in this range? Or are you just conjecturing? Indeed, the previous model pioneered by Apodments is now illegal due to the common kitchen prohibition, but these do share most of the same characteristics as previous microhousing projects, so I’m not sure some of the charges are fully valid. No confirmation on pricing, estimate based solely on the dozens of examples that I’ve seen throughout the city in the past few months. Curious as to what characteristics of the Greenwood project you feel are closer to Apodments than a more typical apartment project? To me, the Greenwood project seems to be no different than the hundreds of standard apartment buildings I’ve seen sprout up in our city, just with all studios rather than a more standard unit mix. Using some recent projects in the University District as as example; our code used to allow projects like The Venetia (http://apodment.com/uw-area-apodments/venetia/), where rents average $805. 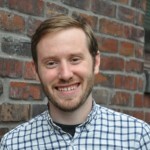 Now, our code forces developers to build projects like Identity (http://www.identityseattle.com/leasing/studios/sx1b/), where the non-MFTE studios start at $1,409. To my eye, the Greenwood project looks to be basically the same as the Identity project — and very different from the old Apodment model. Of course, the Greenwood developer will only be able to charge what the market will bear. But without a supply of lower-priced competitive product like the Venetia, what is going to keep the pricing down? Harold, I’ll provide a follow-up comment to your point above later.